In order to implement the examples in this tutorial, you need to have Python 2.7.x installed(the script might work for Python 3 but haven’t tested yet),Atom (or any code editor) and Tweepy library.Tweepy is a Python library for accessing the Twitter API.If you are new to Python below are resources for you to refer to get started. For Python Installation check this tutorial on how to install Python on Windows,MAC or UNIX/Linux. For Tweepy installation first, make sure pip is installed then run this command on your terminal pip install tweepy to install tweepy.Check this tutorial on how to install PIP. If you are using Windows you might encounter ‘pip’ is not recognised as an internal or external command error when trying to run pip install tweepy.To troubleshoot this error open the CMD or PowerShell copy and paste below values then close the window and reopen.Then run pip install tweepy. If you are still getting the error please refer to this discussion. In order to access and download data from Twitter API, we need to have credentials such as keys and access tokens.You get them by simply creating an APP with Twitter. If everything went fine you will have a window similar to the one below with your keys and access tokens under the keys and access tokens tab.We will use these credentials in our example codes. The REST APIs provide programmatic access to read and write Twitter data,author a new Tweet, read author profile and follower data, and more. The REST API identifies Twitter applications and users using OAuth; responses are available in JSON. 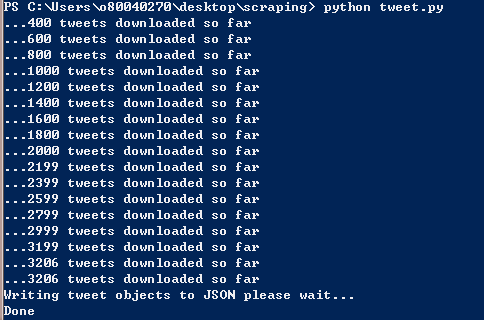 We will use the tweet.py script to download a user’s recent tweets up to a maximum of 3200 the response will be returned in JSON format and saved as tweet.json file in the same folder you have saved the script.If you are new to Python you run the code from the command line by typing python tweet.py but make sure while you are on CMD window navigate to the same folder(my script is in scraping folder) where your script is saved. Before running the code you need to edit the code to include the credentials provided by the Twitter App Management interface in the previous step. consumer_key = "Consumer key goes here"
consumer_secret = "Consumer secret goes here"
access_key = "access key goes here"
access_secret = "access secret goes here"
Also, input twitter username you want to download tweets from. Streaming API provides programmatic access to monitor or process Tweets in real-time.Connecting to the streaming API requires keeping a persistent HTTP connection open. In this example, I will use Streaming API to download all the tweets related to #love and save all the JSON response in a file.This script stream.py will run continuously listening to any real time tweet for #love. You execute the script in the same way like we did last time.On your command line or terminal write python stream.py. Before running this script make sure you have modified the script to include your API credentials and your favourite hashtag or search query. 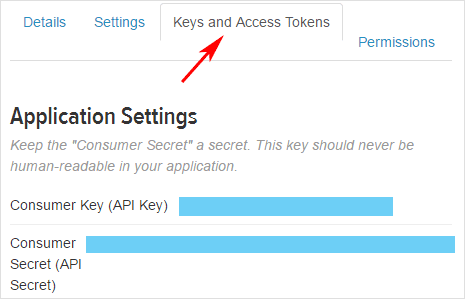 access_token = "your access token goes here"
access_token_secret = "your access token secret goes here"
consumer_key = "your consumer key goes here"
consumer_secret = "your consumer key secret goes here"
The Twitter Search API is part of Twitter’s REST API. It allows queries against the indices of recent or popular Tweets and behaves similarly to, but not exactly like the Search feature available in Twitter mobile or web clients, such as Twitter.com search. The Twitter Search API searches against a sampling of recent Tweets published in the past 7 days. Before getting involved, it’s important to know that the Search API is focused on relevance and not completeness. This means that some Tweets and users may be missing from search results. If you want to match for completeness you should consider using a Streaming API instead. This example will use the search API to download JSON data from Twitter.The script for this example is search.py. You execute the script the same like we did last time.On your command line or terminal write python search.py. Before running this script make sure you have modified the script to include your API credentials and your favourite search query. consumer_secret = "your consumer key  secret goes here"
access_key = "your access token goes here"
access_secret = "your access token secret goes here"
Below are available Query operators you can use for the search term. movie -scary : ) containing “movie”, but not “scary”, and with a positive attitude. flight : ( containing “flight” and with a negative attitude. Here(1.92MB) is the JSON response file returned by this query. The JSON format files returned by the scripts have a lot of information which can be consumed by other codes or programs for further data analysis.You can get tweet’s text,images,videos,retweet count,favourite count and much more information.